I was flicking through my old record collection over the Holiday break. I’ve been seriously thinking about getting my turntable working again and dusting off a few of the many pieces of vinyl I haven’t heard in over a decade. Going through the records that had convinced me to part with my hard-earned dollars, I had one very clear thought, “Gee, I was easily amused in my teens.” There we just so many bands that seemed amazing at the time that now seem really damn gimmicky. It’s funny how age and maturity bring such clarity. 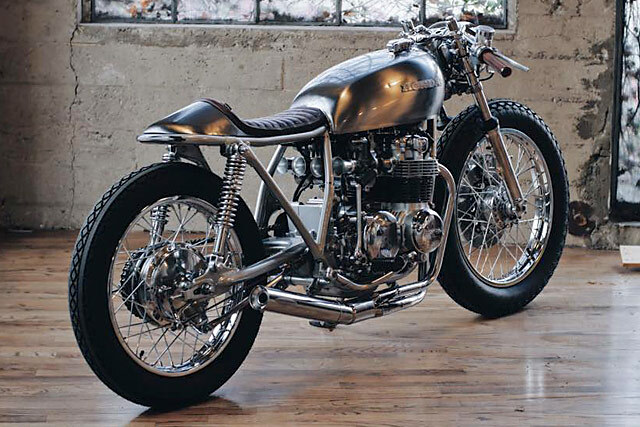 It made me wonder about Pipeburn, and what we’ll all think of the bikes we post in ten years. Now I may be wrong, but I’d happily bet a crisp new $50 on the fact that this one will still wow us… and then some. 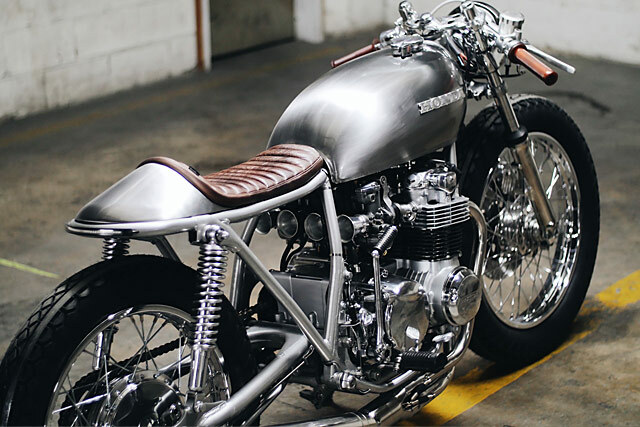 Meet the very mature, and very elegant ‘Amber’ CB550 from California’s Thirteen and Company. 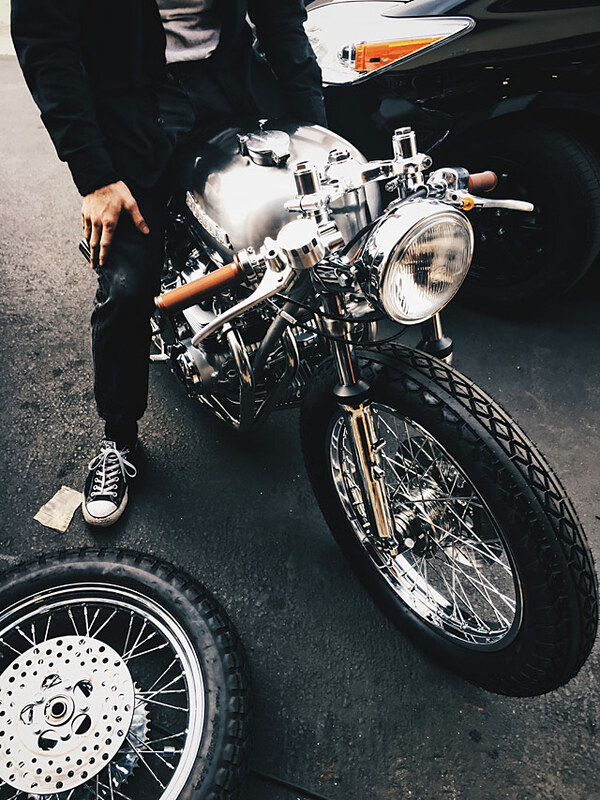 “The goal with this build was to design a motorcycle that was approachable to any rider,” says Thirteen’s Kyle Vara. “Something that displayed a real balance of maturity, elegance, and attitude.” In other words, something that was the polar opposite to my vinyl copy of Hootie and The Blowfish’s ‘Cracked Rear View’, then. And probably all the better for it. “We started with a restoration that went all the way down to the nuts and bolts. The motor remains a stock displacement Honda 550cc four. 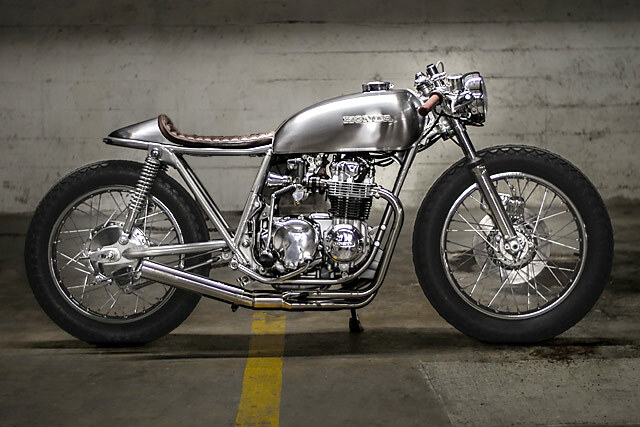 Then we planned out a clean cafe build that would feature a two-part silver and clear powder coated colour scheme and a custom subframe.” And then he got to work. “The seat was handmade with reclaimed Italian leather, and was then matched to some imported Italian grips. 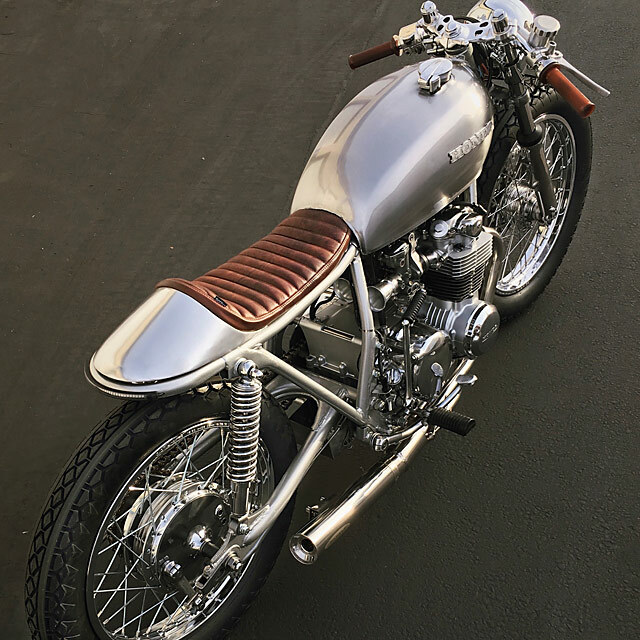 The seat cowl was also handmade to match the brushed steel tank; both were then professionally clear coated to resemble a dense, deep, glass-like finish.” Kyle notes that countless hours were spent sanding, buffing and polishing any and every aluminium part on the Honda. “Then the wiring harness was made from scratch, giving us a streamlined wiring solution.” It’s a nice option if you can manage it, but as any builder will tell you, many people have been brought to the edge of insanity wiring bikes. Clearly, Kyle has managed to escape the asylum. Mechanically, all aspects of the bike have been revamped. 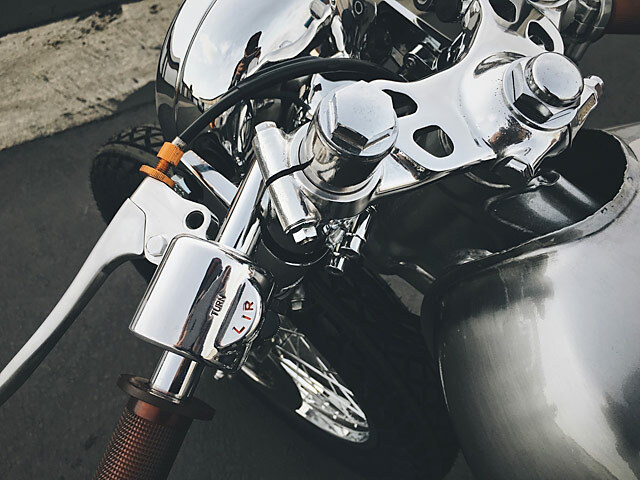 The carbs received a full overhaul and are now topped by four stainless steel velocity stacks that also provide a visual highlight to the bike’s good looks. Keeping the whole chrome party grounded, Kyle mounted a pair of vintage-style Coker Diamond Tread tires, along with new set of D.I.D. chrome rims and spokes. It has an all-in-one LED rear brake, tail and turn lights subtly integrated into the bike’s new rear loop. 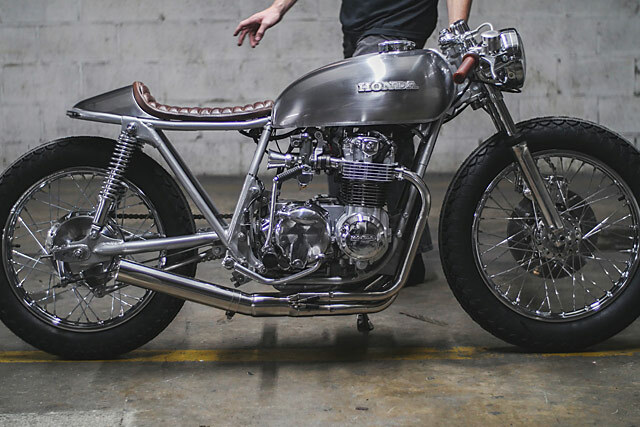 And the custom stainless steel 4-into-1 exhaust gives the ‘76 Honda‘s voice a bit of meat, without making it too tiring on longer rides. We’re no experts, but shouldn’t that rear tyre be attached to the bike? As opposed to building bikes to customer specifications, Kyle says he likes building bikes that are entirely his own design, and then selling them when they are finished. It allows him to have full control of the creative process and removes the natural limitations that customers bring when it comes to price, color or specifics. “With that said, we will always build bikes for clients as we are a business and we have to pay the rent. We just prefer to build our own,” he notes. The most challenging part of this build for Kyle was deciding on a seat cowl profile that was inline with his overall vision of the project. “We have made many cafe-style seats in the past, however this one called for a cowl that was a bit longer and lower. After a couple of hours beating and rolling it through the English wheel, we had come up with something that really fit the part.” I couldn’t agree more. Kyle closes by noting that this isn’t a usual build for Thirteen and Company. “What I like about this Honda is that it broadens our range as a company. We typically like to build edgy, race-inspired bikes. But I think that this bike breaks that mold.” So with a choice of race and edgy or maturity and elegance, which one would you choose? Tough call, yes? I agree. Let me put on some Hootie and the Blowfish to help us all decide. Hey – where are you all going?